Since I am posting this from home, I can share more pics of some quilts I've made. 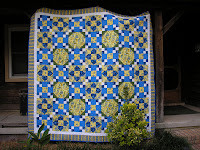 This pattern is from quiltville.com by Bonnie Hunter. 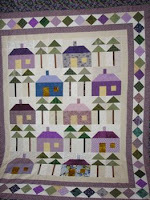 It was the Mystery Quilt she called Double Delight. I really love how it turned out. I think of it as a Valentine's Quilt because it is like chocolate covered strawberries to me. This is a photo of the layout, and it is now finished, so don't think this is a UFO! Next is a commissioned quilt I did last year. 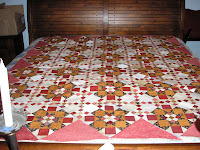 It is a variation of Prairie Star Promise from McCall's Quilting magazine. It is queen size. 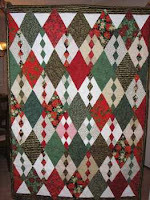 Next is a lap size Christmas quilt I made several years ago. This one was in American Patchwork and Quilting magazine. It should have come with a warning. Rating quilt patterns at skill level should include whether you have loads of patience or not. Maybe they should recommend you take a class on patterns like this rather than working alone with sharp instruments. You should have heard the cussing! My first (and last so far) attempt at diamonds. I mentally cut it up and burned it several times before I got it finished. It is now much loved and used by my daughter in law. I gave it to her at Christmas last year. Last for today is this full size quilt that still has no binding after 2 years. I felt bad about not getting it done, because I intended to donate it to the Ronald McDonald House here in Pensacola, but then I heard they are building a new, bigger house, so I have time to get this one finished. I drove by the site the other day and they are at the framing stage, so I have, say 6 months? No pressure now! I still have not made out my Christmas cards!! How terrible is that? I have a good excuse though. 2 days of helping my daughter move to her new place, shop, unpack, take care of the baby. It is a lot of work! My family has a LOT of moving experience, so when everyone went home last night she pretty much had to unpack her clothes and that's it. those are some pretty amazing quilts Wendy! These are really beautiful quilts. You have quite the gift.